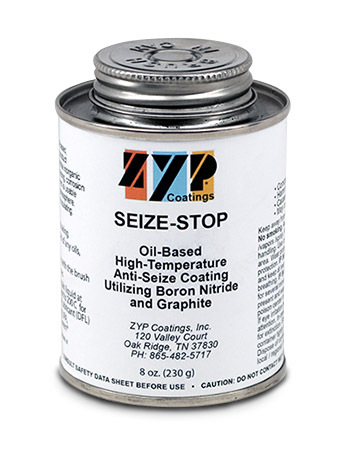 Seize-Stop - ZYP Coatings Inc.
Seize-Stop Non-Metallic Anti-Seize has been formulated with highly lubricating oil and powder lubricants. Seize-Stop provides anti-seize protection in industrial applications where metal containing products are not allowed, such as when the environment or regulations dictate a non-metallic product. It is an excellent anti-seize for most all metals, including plain carbon steel (mild steel), stainless steel, other alloy steels, titanium, nickel, aluminum, and soft metals. It prevents seizing, corrosion, rusting, and galling between metal parts, and is recommended for service from ambient to 900 C (1652 F) in air atmosphere.